Lydia Nell Poole Pittman, daughter of Rebecca and Cleveland Poole, wife of Tommy Pittman. Tommy Pittman, Oscar Thomas Pittman, Sr. and Julie Evans Pittman, husband of Lydia Nell Poole Pittman. Lydia Nell "Pat" Pittman, 65, of 179 Martin Loop Rd., Cartersville passed away Friday, June 15, 2007 at the Floyd Medical Center. Born August 28, 1941, Mrs. Pittman was a native of Bartow County and was a member of Blue Springs Baptist Church. She was the daughter of Rebecca Poole Hasting and the late Cleveland Eugene Poole. 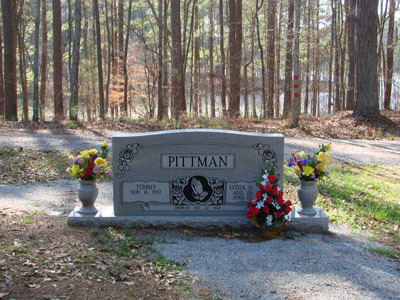 Although she had been physically disabled for several years, Mrs. Pittman had a good sense of humor and valued honesty. She was a loving wife, mother, daughter, sister, and grandmother and will be missed by all. She was preceded in death by her sister, Margie Poole, and her brothers, Lonnie Poole and Earl Poole. Survivors include her husband of 45 years, Tommy Junior Pittman; her children and their spouses, John and Brenda Pittman of Cartersville, Jack and Gail Pittman of Cartersville, Jeff and Judy Pittman of Acworth, and Julie and Francisco Pittman of Kennesaw; her mother, Rebecca Poole Haisten of Cartersville; her brothers and sisters-in-law, Billy and Marlene Poole of Ellijay and Paul and Patricia Poole of Waleska; her sisters and brother-in-law, Kathy Gravley of Woodstock, Martha and Jimmy Mitchell of Cartersville and Ellen Bost of Greenville, North Carolina; 10 grandchildren; 10 great-grandchildren; and 14 nieces and nephews. Family and friends will gather to celebrate her life on Sunday, June 17, 2007 at 2:00 p.m. in the chapel of Parnick Jennings Funeral Home and Cremation Services with Rev. David Abernathy and Rev. David Mitchell officiating. Burial will follow at the Old Macedonia Cemetery. Mrs. Pittman's nieces will serve as pallbearers: Shelby Price, Becky Rivers, Penny Davenport, Aliesha Davenport, Jessica Loading, and Jennifer Denson. Mr. Tommy "Junior" Pittman, 76, of Cartersville, passed away Friday, July 18, 2014 at his residence. He was a native of Bartow County; born November 18, 1937, the son of the late Oscar Thomas Pittman, Sr. and Julie Evans Pittman. Mr. Pittman was a member of Ropemill Baptist Church in Woodstock. He was employed by McArthur Concrete for forty years. Junior was an avid Braves fan, a tough but fair man and was a straight shooter. Preceding him along with his parents is his wife, Lydia Nell Poole Pittman; his sisters, Dorothy Plott and Arlene Hazelwood; and a brother, Harold Pittman. Survivors include his daughter, Julia Pittman of Kennesaw; his sons and daughters-in-law, John and Brenda Pittman of Ellijay, Jeff and Judy Pittman of Cartersville and Jack and Gail Pittman of Cartersville; ten grandchildren; twenty great-grandchildren; two sisters, Rachel Hazelwood of Cartersville and Fay Stevens of Cartersville. Funeral services will be conducted at 2:00 p.m., Monday, July 21, 2014 in the chapel of Parnick Jennings Funeral Home and Cremation Services with The Reverend Roland Lee and The Reverend Phillip Chapman officiating. Interment will follow in Old Macedonia Cemetery. The family will receive friends from 6-8 p.m. on Saturday and Sunday night.